This April will mark 10 years since guitarist Tosin Abasi made his debut as Animals as Leaders with a self-titled debut album. Now a full-fledged trio, the metal outfit will celebrate a decade of music-making with a commemorative tour. The celebratory trek will kick off May 1 in San Antonio, with the band playing 18 dates total across North America. 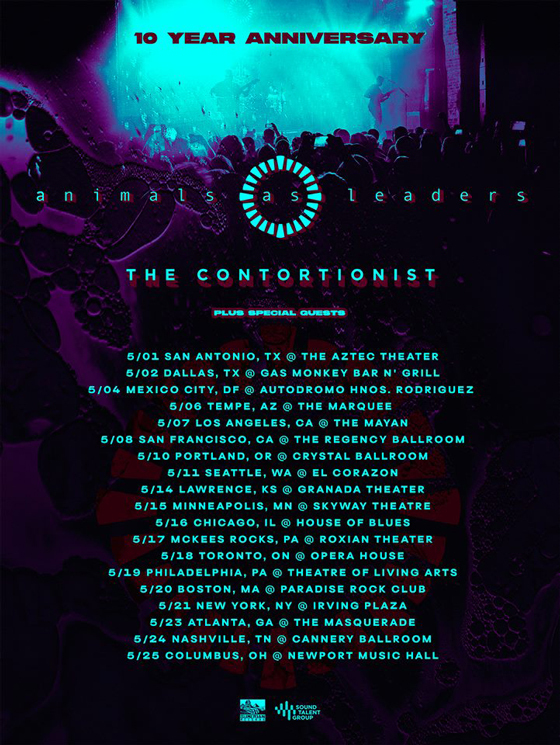 Support on the run will come from fellow prog metal outfit the Contortionist, with a tour poster promising the appearance of additional "special guests." A lone Canadian stop will bring the bands to Toronto's Opera House on May 18. Tickets for the run go on sale March 1 at 10 a.m. local time. You can find a complete tour itinerary below. Abasi released the instrumental Animals as Leaders through Prosthetic Records in 2009. Produced by Periphery's Misha Mansoor, the album shone a spotlight on Abasi's virtuosic guitar talent and technique in a metal style that drew influence from jazz and electronic. Animals as Leaders — which now features Abasi, guitarist Javier Reyes and drummer Matt Garstka — last released The Madness of Many in 2016. The Contortionist delivered their Clairvoyant LP in 2017.